Day 1a of the 2010 World Series of Poker main event has just come to a close. Day 1a of the event had a total of 1,125 entrants, including the likes of Greg Raymer, Chris Moneymaker, Michael �The Grinder� Mizrachi and celebrity Ray Romano. 819 of the 1,125 Day 1a entrants managed to make it through to Day 2A, which will take place later in the week. Final end-of-day chip counts have not been released as of yet, but Dwyen Ringbauer looks to be leading the pack with a stack of nearly 200k. Michael Mizrachi, Barry Shulman, Chris Moneymaker and Lacey Jones all look like they finished the day with above average stacks as well. In case you were wondering, the turnout for Day 1a of the 2010 World Series of Poker (1,125 players) was slightly higher than the turnout for Day 1a of last year�s main event (1,116 players). 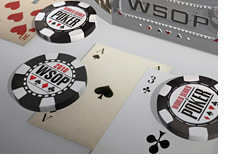 According to the Pokerstarsblog.com Twitter feed, 4,400 people have registered for the main event so far. Assuming that there are no registration issues (hundreds of people were shut out of the main event last year after Day 1D sold out), there appears to be a very good chance that there will be 6500+ entrants this year (which would top 2009�s total of 6,494 entrants). Good luck to everybody that is playing in the main event this year..